Life Excellence Insights: When do you lose your value? When do you lose your value? Recently I received this photo from one of my friends. 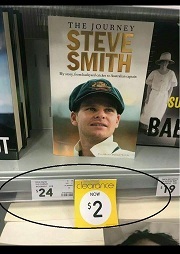 I am not sure whether this is a sales discount as a consequence of Steve Smith's involvement in “ball tampering scandal” news or year-end sales push as coincidence. However, this picture reminds profound life truth. Your value would come down the moment you lose your core life values like integrity, honesty, fairness for the sake of a quick win.This truth is not only applicable in sports, nowadays, but we also hear/watch the news on scandals in all spheres of business, especially in banking, that too, from a respected corporate man/women whom most of the youngsters are looking up as a role model. When they trade their values for short-term materialistic advantages, we lose the respect of those people, irrespective of their education, positional status, past achievements in their profession. In Life, you can regain materialistic assets even if you lose, but you cannot regain once lose your internal consciousness if that is traded for low values.Hold on your high values for your peace and people under you as they are watching you, They can be your peers or subordinates or even your children .! Who is a winner when you quarrel? How to change the mindset of others?